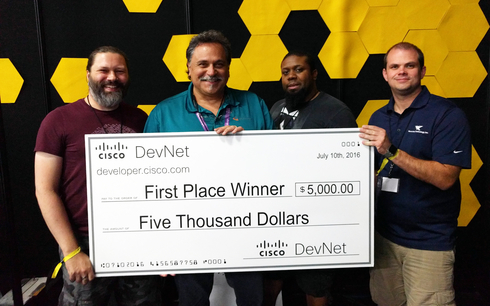 David Guidos, a senior software engineer, and a team from Asynchrony Labs and World Wide Technology demonstrated their bee-saving software project at a hackathon taking place at Cisco Live conference in Las Vegas. The team also included Shawn Donoho, Todd Erickson and Timothy Fuller. When working on this project, Guidos’ team began to think about beehives that are placed out in the field so a farmer can have his property pollinated. They asked how one could determine how effective the placement of those hives were. With this question in mind, Guidos and his team used a simple Raspberry Pi 3 with built-in communications, coupled with an inexpensive USB microphone, as a way to create sensors that can detect the buzzing sound of bees. This technology is able to listen for the buzzing to detect which areas the bees are visiting—and which areas they are not. Depending on where the sensors are placed, Guidos said it was useful to put a solar battery pack on the device so the farmer doesn’t have to run electricity to where the sensors are. The sensors then communicated over WiFi and received the information using Cisco technologies, such as Relayr, a cloud platform that gets information up to servers. The sensors also used Cisco’s Tropo, designed to automate communications by connecting code to a phone network with voice and messaging. Tropo is also good for voice alerts to let a farmer know if a predator is attacking their hive. “If we find out that certain areas are not being visited by the bees, than we know [that] maybe relocating the hives a little closer might get the bees spread out a little better,” said Guidos. The team also used a thermal imaging camera in addition to the audio sensor. Guidos said someone can place this camera next to a beehive to monitor its health, and it can detect whether the heat generated from the bees demonstrates activity in the hive. It can also detect predators, like a weasel trying to get at the honey in a hive, he said. The team comprised a mix of employees from WWT and Asynchrony Labs. From left to right: Shawn Donoho, David Guidos, Timothy Fuller and Todd Erickson. To get the sensors to detect the bees and their buzzing, Guidos had to develop a program that listens for this sound. It would then then perform a fast Fourier transform, which determines what frequencies the microphone can pick up. According to Guidos, bees’ buzzing is made up of “clicks” that sound between 190 to 250 times a second. Those clicks are actually pings, which are about 1,600 hertz at the end of each cycle. The team also wants to experiment with the software so it can detect other types of insects and eliminate their sounds. Bugs like grasshoppers or potential predators like hornets can be factored out to see what is actually harming the bees. While this project is not Guidos’ or the other team members’ full-time focus, he said that “keeping bees healthy is so critical to our planet.” He wants to take the program he wrote for the sensors and put it on GitHub so other developers can get involved. “Plan Bee,” the name of their hackathon project, most likely will also be the name of it on GitHub.